Parents are the primary teachers of their children. 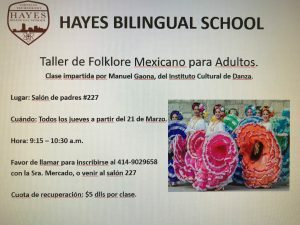 Hayes Bilingual works with parents to create a positive school environment and improve student learning at school and at home. We encourage parents to be actively involved in the school community by the sharing their talents and skills in the classroom and in extracurricular activities. Parents have the opportunity to participate in monthly PTO meetings, informative workshops and field trips. They can also participate in the School Governance Council, which is involved in school decision-making.